We all laughed at Qualcomm at CES earlier this month when they opened their keynote with three individuals who, for want of a better phrase, proudly proclaimed they were “born mobile”. And while they came across as completely bizarre, their message was sound, even though their delivery wasn’t: we’re now in a generation where people have screens in their faces all the time. If we’re not looking at our iPhone on the street, we’re looking at our iPad, on the bus. If not the iPad, then the MacBook Pro at work. Or the iMac at home. The LCD TV connected to the Apple TV and/or Mac Mini in the lounge. And even when we’re in bed, the screens don’t stop: maybe we have a Kindle. 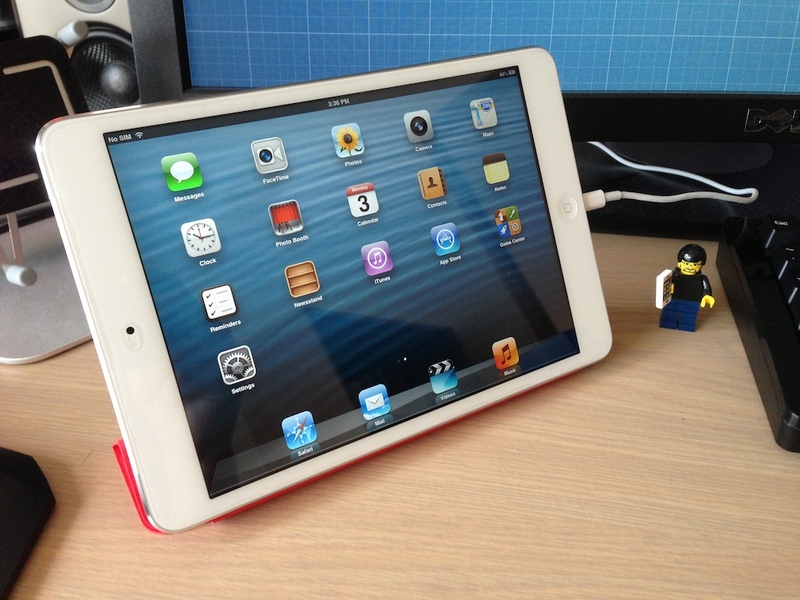 Or maybe we have the new-fangled iPad mini, and look at that before going to bed. And when we wake up, the first thing people do is check their iPhone on their bedside clock radio. It’s scary how much time we spend connected. We invented things like push email to get our email delivered directly to all our devices, all at the same time. We invented push notifications so we could always know when people mentioned us on Twitter. There’s no denying that we live in a fast-paced world these days, and maybe you love that. But I want to stress the importance of taking a break every now and again — not just for your sake, but the people around you, too. Maybe it’s why everyone is ditching their iPhones and going back to dumb-phones. Or maybe why The Verge’s Paul Miller is currently spending a year away from the internet. So you see, maybe it’s not about cable management or the importance of cleaning your Mac at all. Whilst those things are both important in and of themselves, it’s the underlying premise of both that’s the real message here, the need to turn off. Think. Read a book — an actual book, not one that you’ve just purchased and downloaded with Amazon’s wonderful one-click purchase system, which instantly pushes the book to your eReader of choice. See what I mean? Think about it: when was the last time you went without staring at some array of pixels for some amount of time? If you’re not looking at your computer, you’re looking at your phone. Or playing with your iPad. Using a digital camera. And so on, and so forth. The question then becomes: where and when do we draw that line in the sand and say: “hey, I just need a moment to myself.” A little alone time, time away from Twitter, time away from Facebook, time to just sit, think, and contemplate the meaning of life, the universe, and everything? Not even thinking about anything in particular. Just the chance to have a little down time every now and again. The chance to get offline. Paul Miller is doing without the internet for an entire year. Strange, for a technology writer, but he’s writing about it at The Verge, where his Offline series of posts are always bring up an interesting point from the disconnected world. And he’s not the only one. In this ever-connected society we live in, people are leaving their iPhones behind. It’s not that they don’t find 24-7 access to the internet inconvenient or anything, it’s just that, well, it can be a burden as much as it can be a blessing. Using your smartphone to find any information on anything is great and all, but you know what’s even better? Having time to yourself where you’re not staring at some pixels, no matter how pretty they may be. Don’t get me wrong, I’m usually very appreciative of being able to look something up quickly, fix something wrong with a server in a different state, or whatever else. It’s great to be able to have that constantly connected access in the fast-paced life of today. We may not have flying jetpacks or hoverboards like sci-fi movies predicted, but we do have these pocket-sized devices that mean we’re a moment away from the collective knowledge of humankind, devices that can connect us instantaneously to someone on the other side of the world. But sometimes, just sometimes, that can be as exhausting as it is exhilarating. Being constantly switched-on, being constantly connected is a chore when all you want to do is do the exact opposite. Maybe you know someone that goes on hikes for days at a time. Someone that spends a lot of time, not necessarily alone, but away from technology, away from those pretty pixels. Maybe they take a day away from technology every week. Maybe they have a policy of doing as much exercise as they do sitting down and playing computer games. These are all good things, to be sure, but what if they’re not for me? Maybe then, the answer to this business of switching off, of taking a break, is not to do less interaction with technology, but to do more of the other stuff. In my opinion, a big part of the problem is how much time we spend doing technology-related things — leaving precious little time for the other things, the non-technology stuff. Somewhere along the way, we lost our balance — if you seem to be spending your entire life in front of the screen, maybe that’s because you are. The solution then, is simple: do other stuff. Get the balance back. I don’t make many New Year’s Resolutions. But if I were to make a resolution, right now, it would be to simply read more books. I mean, I have a Kindle for a reason, right? (And I’m talking about the book-reading reason, not the “I’m an avid technology enthusiast” reason.) I didn’t read many books in 2012; one book on Kindle, maybe a handful of paperbacks. I want that to change in 2013. Read more books. I can do that. tl;dr – Your 1920×1080 TV takes a 1920×1080 signal, chops the edges off it and then stretches the rest to fit the screen because of decisions made in the 1930s. via mjg59 | TVs are all awful. Alternate title: iPhone 4 review. ‘Cos this is what this is. It’s just a phone, guys. Aha, but you see, dear reader, that is where the distinction ends. It’s a phone, but it’s also a gateway to the Internet. An incredible communication device. An excellent media player. A brilliant email client. And even a capable games console. That, ladies and gentlemen, is the iPhone 4. As I stood outside T-Life Northgate, eagerly lining up for the midnight launch of the most anticipated smartphone yet, some Optus-reseller employee comes up to us. After a short chat about mobile telco’s (there is no comparison between Telstra and Optus, especially in Tasmania), he decided to give us a sneak-peek at his stores’s demo unit. A couple of hurriedly-tweeted TwitPics later, some Angry Birds launch-time speed tests between the 4, a 3GS and a 3G, and not a few “oohs” and “aahs” at that gorgeous retina display, and our iPhone 4 lust hit fever pitch. That last hour was the longest hour of my life. But it was cool, because I got to spend it chilling with some very cool Apple camaraderie – who provided an ample supply of entertainment, gummy bears, and decent conversation. I wouldn’t have had it any other way. After what seemed like an age (but in reality was only five hours) I was second into the store, behind the very nice man who had provided my night’s transport – I felt I owed him that much, at least. Out again not 20 minutes later, one 32GB iPhone 4 in hand, I was the first out – beating the first guy in by mere seconds. The front half of the line (which by now spanned more than 100 people, easily) applauded me as the first to emerge from the T-Life gauntlet, and I was the first person in Tassie with the Apple’s most highly-coveted offering so far. Bringing it home later that night (or early that morning, as the case was) and setting it up from the comfort of my own bed was an absolute joy. Downloading my most frequently used apps, setting my email, Twitter, Facebook, IM accounts – the first thing I noticed was how much faster the thing was. Downloads, installs, any operation at all, just flew along. Sheer unadulterated speed oozing from every animation, every transition, every app launch, every fast app switch. And no keyboard lag! Early the next morning I took out my cut up SIM (that I had converted from a mini-SIM to a micro-SIM the night before with my handy-dandy SIM cutter), and put in the official micro-SIM that had been provided as it had been activated and was ready to go. No dramas there. Spent the whole of Friday babying the thing – the whole experience wasn’t as “wow” as it was when I originally got an iPhone almost two years ago now, but it was still a worthy upgrade (thanks in part to iOS 4 suffering serious performance issues on an iPhone 3G). Again, speed was the most noticeable thing here – the phone was markedly more responsive. It kept me entertained through dull Games Physics lectures, and was an excellent public-transport companion thanks to the small music selection I had synced on earlier that morning. The camera is nothing short of amazing. The colours of any photo just “pop”, and it’s nice to finally have a camera that has an autofocus that actually works – which means macro photos are now able to be taken without any of that blurriness the 3G camera exhibited. While I haven’t yet used the video camera for any serious purpose, I’m sure the opportunity will eventually arise. While the screen is the most gorgeous thing I’ve ever laid eyes on (if I had a girlfriend this sentence would read differently), to be honest you have to be looking pretty hard to notice the difference in everyday things (typing out messages, – maybe it’s because I’m using it with an anti-glare screen protector (which sacrifices screen clarity for a more matte look [as opposed to the glossy]), or maybe it’s because my eyesight is absolutely terrible. Either way, the difference is figuratively night and day when placed to a previous-generation device like the iPhone 3G or 3GS (as they have the same screen). Text is one of the things that benefits the most from the much higher pixel density and improved screen tech (IPS vs traditional TN) – increased contrast and no more jagged edges means text is now clear as, well, crystal. The new font is a welcome change as well! Technologically, it’s very impressive – the best mobile display on the market paired with an impressive (but not exhaustive, Apple aren’t known to have features for the sake of it) feature list, and one of the best smartphone platforms on the market today? A winning combination, indeed.